The best of the cruises are offered here with choice of boats, destination and activities. 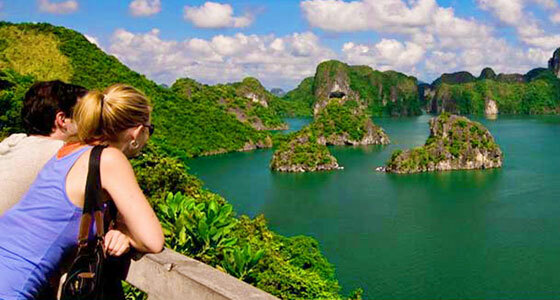 Glorious Ha Long Bay is a must when you are visiting Vietnam, so do it in style! If you want a more varied experience and wish to stay on an islands and do more kayaking and trekking then you may like to try one of these action packed tour. Bai Tu Long Bay is equally beautiful but has fewer tourists. Kayaking, swimming, trekking and cooking are all on offer and there is more chance to meet the local people. The cruise was inspired by the luxurious life of Emperor Bao Dai, Vietnam's last. Therefore, the boat itself is a discovery of the 30s with INSPIRED Design , RICH IN HISTORY and Royal Heritage. We bring your customers to Experience Every Moment with us by being treated as kings and queens, indulging in services such as music, fine art, architecture, culture, cuisine, history, and outdoor & indoor activities, life on boat, stories of the Emperor Bao Dai through the design and where everything is all included. Destination: Bai Tu Long Bay, Quang Ninh province, Vietnam. 12.00 Upon arrival at Emperor Cruises, located at Hon Gai dock, our team will welcome you in our lounge before boarding. 12.30 Our Experiences Manager will assist you with boarding to start cruising in Bai Tu Long Bay. Check in to your cabin as we set sail from Vinashin dock to cruise among the many beautiful islets (scenes from the film ‘Indochine’ were filmed here). 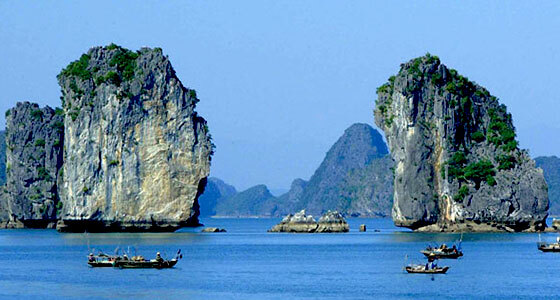 Bai Tu Long Bay has a wild beauty and the panoramas from the boat are unforgettable. 13.00 An a la carte lunch will be served at our Royal Restaurant on the main deck. Savor delicious Vietnamese food while admiring the grace of the bay. 15.30 Visit Vung Vieng fishing village, the famous pearl-growing village, to view the fishing tanks of the local people. You have time to observe the process of feeding pearl as well as learning a little about the life of the local people. 16.30 Proceed to Vung Vieng floating village to board bamboo boats so the locals can row you around their village and oyster pearl farming plots. Return to the boat by speedboat. 16.35 The cruise continues from the Vung Vieng fishing village to Cong Do (sleeping area), where you will enjoy the wonderful beauty of Bai Tu Long Bay at sunset, admire the striking islands and islets, relax, indulge yourself and savor the peaceful atmosphere which can only be found out here among the islands. 17.20 Choose from kayaking, just relaxing or taking afternoon tea and watching the sky color change as the sun sets. 18.15 Attend our chef’s cooking demonstration and try your skills in the art of traditional Vietnamese cooking (making spring rolls) in a truly stunning setting. 19.00 Enjoy our a la carte 5-course menu for dinner on board as you experience the charm of Bai Tu Long Bay at night. 21.00 Evening activities: enjoy our Movie Night, Board Games or our Massage and Spa services or even go squid fishing. Overnight on board Emperor Cruises. 7.45-8.45 Explore the area of Hon Co Island and Co Cave (Grass Cave, also known as Thien Canh Son). You can revel in the breathtaking view of Bai Tu Long bay from up high, as well as the glorious long white-sand beach of Hon Co Island. Afterwards relax on the beach, go swimming in the crystal clear water and explore the cave. 9.15 Arrange the luggage and check out. 9.30-10.30 Enjoy brunch on board while cruising back to the mainland. 11.15 Arrive back at Emperor Cruises dock, Halong City for disembarkation where your driver waits to take you back to Hanoi or the airport for your onward journey or home. 12.00 Upon arrival at Emperor Cruises, located at Vinashin dock, our team will welcome you in our lounge before boarding. 16.30 Proceed to Vung Vieng floating village to board bamboo boats so the locals can row you around their village and oyster pearl farming plots. Return to the boat by Small boat. 06.00-06.30 Welcome a new day with an amazing dawn on Bai Tu Long Bay with a Tai-chi/Vovinam session on the sundeck. 07.00-07.45 Catch the morning view of seascape while enjoying the breakfast in the restaurant. 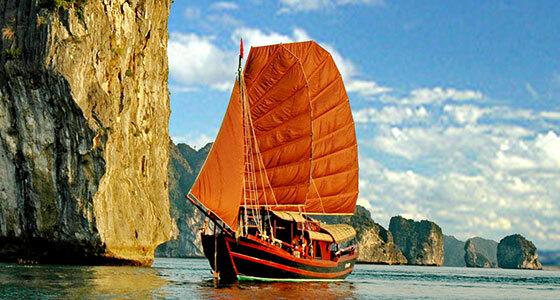 08.00-08.15 Transfer to Day Boat and start cruising to admire the widest beauty of Bai Tu Long Bay. 08.30-10.00 Kayak and discover Thay Cave - one of the most large & well-hidden cave in Bai Tu Long Bay. 11.00-12.00 Visit Cong Dam Area- Hon Xep Nature Park - Deep into Bai Tu Long Bay, the famous hidden lagoons covered by majestic limestone islands and islets with wild beaches. 19.00 Enjoy our dinner on board as you experience the charm of Bai Tu Long Bay at night. 8.45 Return to the cruise by speedboat. 24-hour room service with no additional charges. Mini-bar replenished daily with soft drinks, beer and bottled water. Unlimited drinks: water, tea and coffee, house wine, local beer, fruit juices, soft drink, cocktail, mock tail. Unlimited beach activities such as kayaking, squid fishing. Upgrade to higher category accommodation or transportation (subject to availability). Free bank charges if paying by credit card. All other services not mentioned above. - VND 805,000 is a surcharge if an extra bed is required for FOC child in 3 days/2 nights. Only 01 child under 12 years old are allowed to share cabin with parents. FOC 1 child under 5 years old per booking for half day and full day SIC day cruise including meal onboard. Discount 50% for half day cruise, full day cruise and meal onboard for child 5 – 12 years old. Mr Linh's Adventures © 2014 - 2015. All copyrights reserved.